Signature Arts, Inc.: News in the Authentication World! A few different sellers are now selling forged single signed "autograph" baseballs on ebay. The quality of most of these forgeries is poor. The sellers are selling them as "replica" baseballs, but the novice collector should be especially careful now when buying single signed baseballs. When buying single signed baseballs (or any autographs) KNOW YOUR SELLER, know that he is a hobby veteran, know that he will honor a lifetime guarantee and that he will stand behind his autographs. The trend of card companies placing signatures on trading cards has hit a new low. Even the Beckett Company has made negative comments about what card companies have done on these cards. In order to make these cards more "valuable", and I use that term valuable in a very derogatory fashion, they place a signature on a trading card and number it 1/1,2/15, 3/1000, etc. Observe the card illustrated below and see what Topps has done. 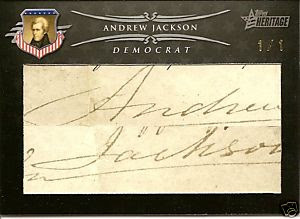 The signature of Andrew Jackson, a great American President, has been obliterated for the purpose of creating a trading card that is allegedly more "valuable" than his regular signature. Let's look at the facts here. Andrew Jackson always signed his name on one straight line. This signature was cut from a document and then cut in half in order to place it on this card. In addition, note how parts of some of the letters have been destroyed. All for the sake of creating "rare, manufactured memorabilia". In my opinion, this is a pitiful and pathetic practice, you should be ashamed of yourself Topps. This card has appeared on ebay at least twice, the seller has reduced his price, and it has not sold. It appears that complaints against American Memorabilia are piling up on various internet sites. They still, apparently, are late paying their consignors or in some instances have not paid at all. Various websites and blogs are reporting this. I don't have first hand knowledge of this, but I am seeing reports on websites and blogs. Apparently threats to report them to the BBB or take them to court don't even work anymore. The rating of American Memorabilia with the Better Business Bureau is now an F as of 12/7/09. That is the worst possible grade from the BBB. As of 1/20/10 the grade has been raised to a D+. That is still a pretty awful grade to have from the BBB. I have received several e mails from collectors who have read my info and still are waiting for payment from American Memorabilia for past auctions. I am seeing many fake certificates of authenticity on ebay used by sellers of fake autographs. Check out what you see very carefully in ebay auctions. Make sure you get the number of the COA and check the legitimacy of it. Make sure the COA has a name, address and phone number of the person/company that is authenticating the item. Mastronet still owes consignors from February auction. Blogs and forums on the Internet are still running threads and posts from nervous and angry consignors who have not been paid for their consignments from the February auction by Mastronet. An auction house that was quick to criticize others is now under intense scrutiny and has created a very difficult situation for many who are still owed serious amounts of money. What goes around comes around. What is going on here with Mastro/Legendary auctions? It is now apparent that the reshuffling of Mastro Auctions into another entity Legendary Auctions has created a very unhappy situation for many consignors to Mastro. Forums on the internet have been flooded with complaints from consignors who have not been paid for their consignments. Rumors abound about their business practices. Have they shipped auction lots to winning bidders without being paid? Are they financially capable of paying off consignors? I guess what goes around comes around. With the death of Michael Jackson, the hobby will be flooded with bogus Jackson autographs, especially on internet sites. BE CAREFUL who you buy from. The Las Vegas auction company American Memorabilia now has a grade of F from the Better Business Bureau of Southern Nevada. Consignors are posting messages on forums and message boards stating their complaints against this company.